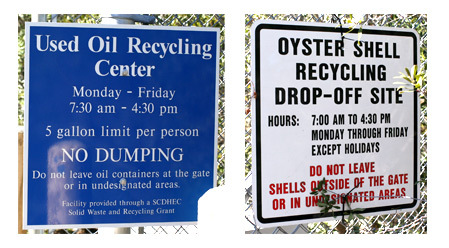 For the past five years, Mount Pleasant has opened their maintenance facility to residents for used motor oil and oyster shell recycling. I know a lot of DIY oil changers, and there’s an oyster roast around every corner, so it’s nice to know there is a recycling option for both activities. The site is located inside the Public Services Maintenance Facility at 1155 Six Mile Road in Mount Pleasant, and is open Monday through Friday from 7:30 a.m. to 4:30 p.m. Check the Town of Mount Pleasant website for more information. 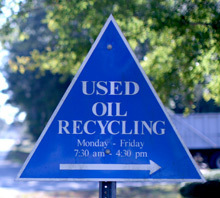 The site accepts up to five gallons of motor oil per visit for recycling. The oil is collected by Santee Cooper, and used as a fuel source at their power generating facility. That’s double cool! The Mount Pleasant facility also has an area to drop off used oyster shells for reuse. The shells can be used to restore natural oyster beds, and can also be used for industrial purposes. Appreciation to my father who told me on the topic of this webpage, this blog is actually amazing.